We have a Rubik’s Cube and the girls are always playing with it. They were around when I was a kid too, but I never was able to master it. Bridget, on the other hand, is a pro! 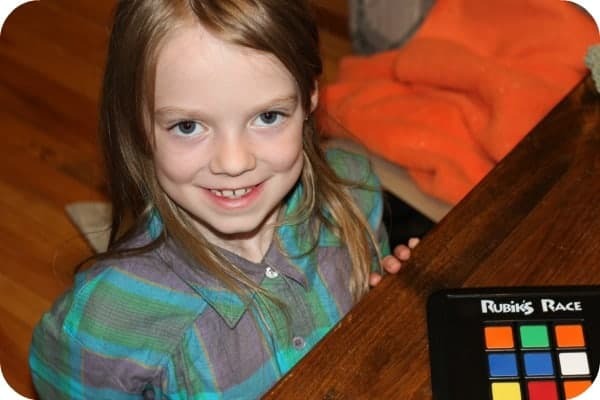 I knew she would love the game, Rubik’s Race, which is a spin on the old classic. Rubik’s Race lets two players go head to head to see who can create the pattern the quickest. It’s fast-paced, fun and a hit with both Bridget (age 8) and Olivia (age 14). Each player gets 24 tiles (4 in each colour) to play on their game base leaving only one space. You shake the Scrambler to see what the game pattern will be. Once the pattern is revealed, each player must slide their tiles on their game base until their tray matches the pattern in the Scrambler. The first player to complete it correctly- wins! Bridget beat the pants off me in our game of Rubik’s Race. I wasn’t even half way finished and she had correctly created the pattern and then wanted to go for round two. It’s also a game that one person could play and just challenge themselves and keep track of time with a stop watch. Once I couldn’t play anymore, I let Bridget do that and it kept her busy for a good hour. The instructions also give alternative ways to play like having a Relay Race and a Three Colour Contest. This game is great because of all the possibilities and kids can create their own rules to make the game go however they like! There’s even an Rubik’s Race app for your iPhone or iPad. It’s $0.99 on iTunes. 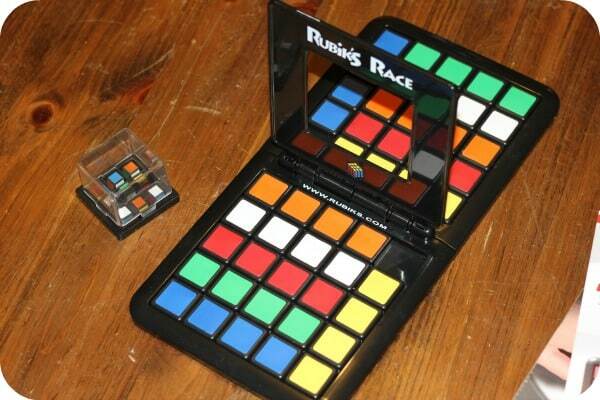 Rubik’s Race is recommended for children age 5+. We had a blast playing it and I’m sure it will get lots of use. Connect with Rubik’s Race on Facebook & Twitter. This looks like a great game, I just might have to get it for Christmas. Oh my 14 yr old son would love this! Must put it on the Christmas list! Thanks for the review! Cool! I had forgotten about this game. I played this as a kid and loved it. thanks for the review. I need to get this for my kids. It’s a great game. I could never master the rubik cube. This might be okay but I will have to leave that to the kids. How fun! I’m sure my grandson would enjoy this. He likes Traffic Jam and Simon. I had a Rubiks Cube and was amazed at the kids that thought to cremove the stickers to win. Cheating but creative! This sounds like a lot more fun than the original cube. I’d love to try it out! This looks like a fun twist to an old game! This is so neat! 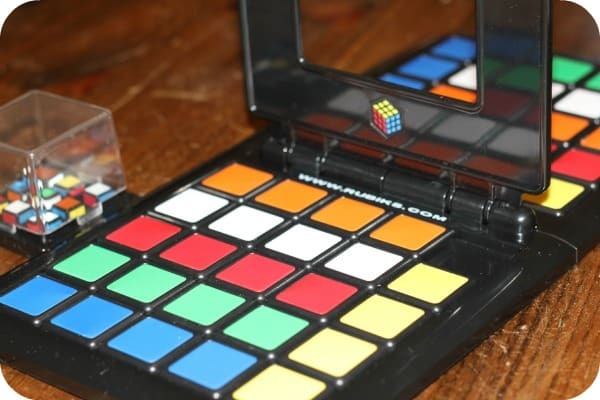 I’m a fond remember of the 80’s and I used to love the Rubik’s cube. I spent hours with that thing. That’s neat, I think that would be fun to play with my husband or daughter! J remember the old cube. It ended under the wheels of my mothers car. I think my grandkids would like it. What an interesting twist on the old cube…I like it! Seems like a great brain booster. I might get this for Christmas for some family members who love games! This sounds like such a fun game! I like doing puzzles and playing games! I played games when I was a child and this one looks like the game for me! I will have to look for Rubiks Race! I never could get the original Rubiks Cube, tried many times never could do it. This game looks like a lot of fun and with the holidays just around the corner I think the kids would enjoy this game. This looks like a LOT of fun. I am rubiks fan and so are the kids. They might just get this for xmas! I had never heard of this game before. Thank you for sharing!! This looks fun! It would be a nice change from video games for my sons! This looks like a fun game – although I never was very good at the Rubik Cube. I think my granddaughters (ages 10 and 7) would like it and probably be able to beat me! Thanks for the great review. This looks like alot of fun! My friend would definitely love this and be right up her alley for her kids too!